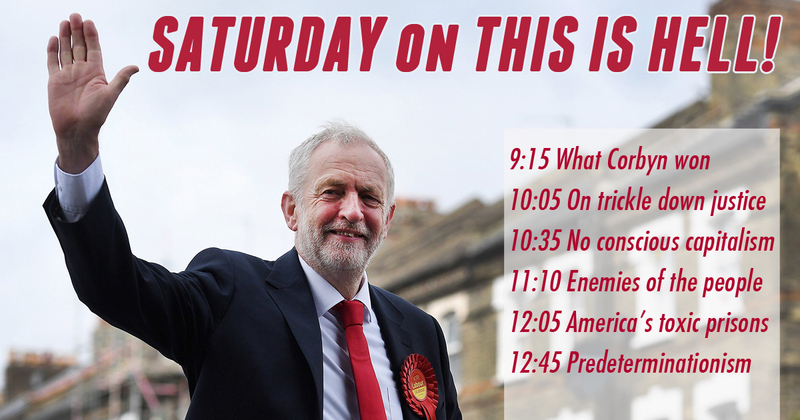 9:15 - Live from London, Richard Seymour examines Corbyn's rise and a new path for the British left. Richard wrote the op-ed Corbyn: shifting the possible for the Times Literary Supplement and the essay Eternal Sunshine of the Spotless Centre for Salvage. 10:05 - Writer Andrea Flynn explains why a class-only politics fails to deliver justice for women of color. Andrea wrote the report Justice Doesn’t Trickle Down: How Racialized and Gender Rules are Holding Women Back for the Roosevelt Institute. 10:35 - Jacobin's Nicole Aschoff charts the downward prospects of Whole Foods-style conscious capitalism. 11:10 - Writer Angela Nagle surveys the dark politics of mass hatred, from Malthus to Pepe. Angela wrote the Baffler article Enemies of the People and is the author of the soon to be released Kill All Normies, which we'll talk about with her in a few weeks. 12:05 - Journalists Maureen Mitra and Candice Bernd explore the toxic (literally) state of mass incarceration. Maureen and Candice are co-authors of the Truthout / Earth Island Journal report America's Toxic Prisons: The Environmental Injustices of Mass Incarceration. 12:45 - In a Moment of Truth, Jeff Dorchen ponders our destiny, such as it is. Or might be. Jeff wasn't super clear about this one.